I've suffered from two major corneal ulcers in my life. And both times were equally painful. I've had bad eyesight my whole life, so I've had to wear glasses and contacts. When you wear contacts every single day, you're bound to take a snooze or two in your contacts. And when I fell asleep in my contacts, I suffered the worst consequence. Imagine waking up and not being able to open one of your eyes. My right eye was in excruciating pain, and my vision was blurry. The level of pain was skyrocketing every second, so I had no choice but to rush to the hospital. The doctor gave me numbing cream to ease the pain and sent me to an optometrist, who later told me I had over 22 tiny scratches on my cornea. So you don't have to deal with the same immeasurable pain that is a corneal ulcer, take the time to educate yourself on everything there is to know to avoid them. Ophthalmologist Alberto Distefano, MD, of Yale School of Medicine has a guidebook on all things you need to know. You can think of a corneal ulcer as an ulcer on any other part of your body, but in your eye. "The cornea is the front, clear part of the eye that bends rays of light toward the back of the eye in combination with the lens inside the eye," explains Distefano. "The cornea is made up of five layers, with the top outer layer called the epithelium, which is like the skin of the eye. If the epithelium breaks down or rubs off but the rest of the cornea is normal, that is a corneal abrasion, which is like having a scrape on your skin. If part of the underlying cornea is also affected, then it's an ulcer. So a corneal ulcer is an open wound of the cornea." According to Distefano, these are the common causes of corneal ulcers you should pay attention to. Infection: "These are the most commonly seen and thought of corneal ulcers," says Distefano. "They often come from overusing and sleeping in contact lenses. The cornea needs intermittent exposure to get oxygen. Contact lenses already act as a barrier to oxygen. This is less so for 'breathable' kinds but still not normal for the eye. When you add the fact that your eyelids are closed over the contacts, your cornea is starving for oxygen. This helps create an environment for bacteria to take over, causing a breakdown in the epithelium, and an ulcer to form." Neurotrophic: "This means that the cornea is unable to feel," says Distefano. "The sensory nerves are disrupted for some reason such as a trauma, herpetic infection, or chronic eye exposure. This leads to your eye being unable to protect itself by blinking or closing properly with trauma and not being bothered when the cornea is damaged. A neurotrophic cornea will not heal properly, and can lead to an ulcer that may or may not be infectious." Inflammatory: "Disorders such as rheumatoid arthritis can rarely lead to a specific type of corneal ulcer that is not due to infection," says Distefano. Eyelid problems: "Sometimes the eyelid can be turned in with the eyelashes rubbing against the cornea or the eyelashes themselves may be touching the cornea with the eyelid in a normal position. The constant rubbing of the lashes can lead to a corneal ulcer." Distefano also points out that trauma, a foreign body like metal, wood, dirt, etc., in the eye, and severe dry eyes are causes of corneal ulcers. The visible symptoms of corneal ulcers range according to the severity. "Some people may notice a small white spot on their cornea without other symptoms," Distefano notes. "These are small ulcers and can be treated easily with antibiotic drops. Ulcers, even small ones in the middle of the cornea, will interfere with your vision, and cause blurring or more severe vision loss. All ulcers lead to scarring when healed. Scarring in the middle of the cornea will cause continued poor vision that can only be corrected surgically. Other symptoms include a red and bloodshot eye, pain, tearing, and mucus discharge.Treatments can include antibiotic drops every hour, lubrication, oral antiviral, antibiotics, and vitamin C."
"Many corneal ulcers come from contact lens misuse or overuse," Distefano explains. "I'd recommend never sleeping in contacts. If you do, wear the extended-wear types. Practice eye hygiene and changing your contacts out at the right time. 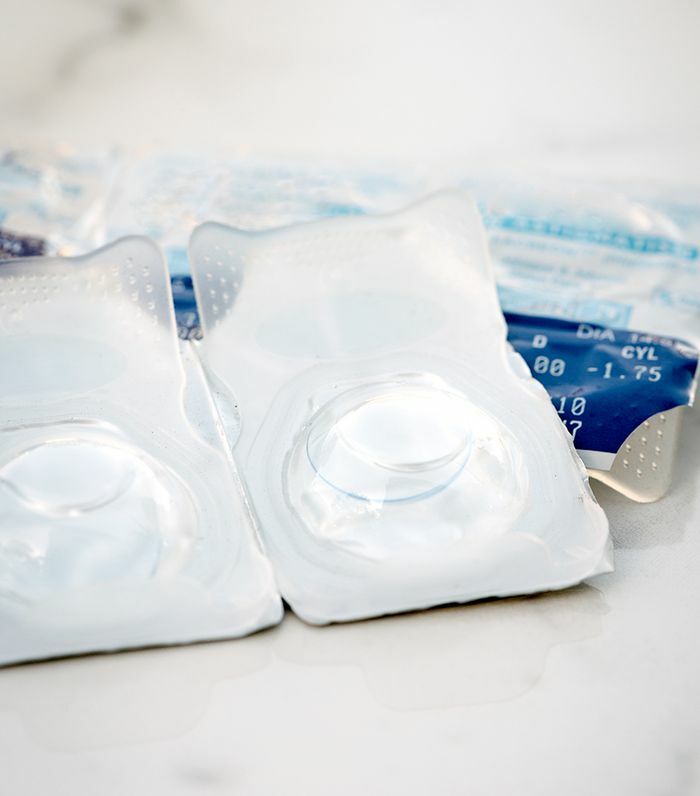 It's important to clean contact lenses carefully and keep the contact lens case clean. Be sure to not use expired contact lens solution." Distefano adds that people working with construction-type equipment must always wear eye protection that covers the eyes, including the sides, top, and bottom of your eye. "This is a really common injury, with most people not wearing eye protection, and those who were wearing their eye protection did not have proper protective gear," he explains.